– Alexander was paid to speak at a Florida conference, but put down time as regular work hours. – Alexander did work for a government contractor that previously engaged in torture. Deputy Mayor Cedric Alexander’s executive assistant has been booking his personal travel as part of her regular job duties. 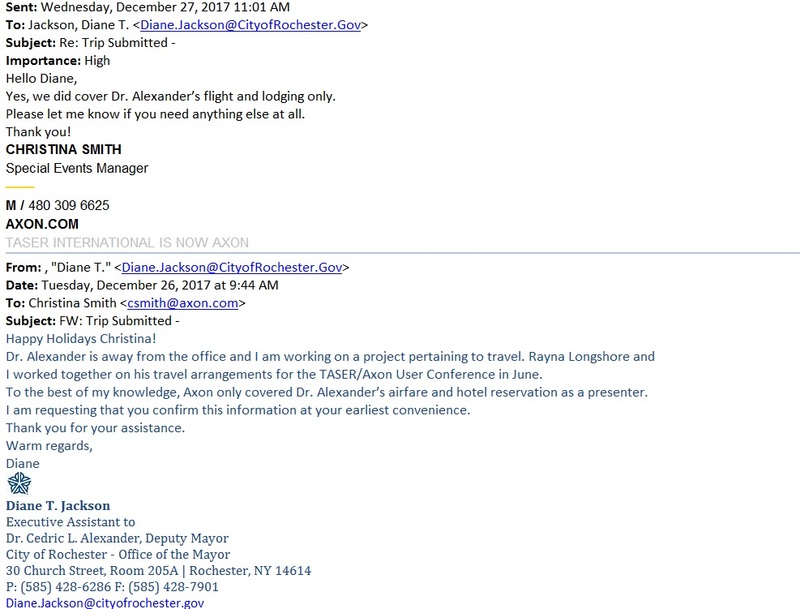 In late February, Rochester for All filed an open records request for all email correspondence about Alexander’s travel arrangements. The city has not provided the documents. However, Rochester for All obtained the material through a source. The emails show Executive Assistant Diane Jackson spends considerable time coordinating Alexander’s travel arrangements, including flights and hotels. We were able to cross reference the emails with his schedule, time cards and travel reimbursements to determine official city business versus personal travel. The emails show Jackson did this work at Alexander’s direction. Alexander is her supervisor. During an appearance on WHAM1180 earlier this year, Alexander said the “DOJ sent him to South Africa.” That’s misleading, as the emails indicate government defense contractor Engility arranged the September trip to train police forces. Engility paid a multi-million dollar settlement for its role in the Abu Ghraib torture scandal. Jackson helped to arrange Alexander’s travel for a meeting at CNA in Washington, D.C. in May. Alexander did not put in any work hours for the trip on his time card, so it was personal business. Our previous reports show Alexander was absent from City Hall for 28 days in his first 25 weeks on the job. The travel records raised potential ethical issues regarding Alexander’s outside business activities and whether taxpayers should foot the bill. The emails raise further questions about Alexander’s potential conflicts. Engility has participated in National Organization of Black Law Enforcement conferences. Alexander is a past official with the group. The city has funded Alexander’s travel to NOBLE conferences, raising questions about whether Alexander is using the trips to secure outside work. The emails also confirm that Alexander received a benefit from his speech at Axon/Taser. The company paid for his travel expenses. This is a violation of the city ethics policy, which a the time forbade gifts of $25. Axon/Taser is a city contractor. The email records also solve a mystery about why Alexander changed his time cards last fall, three days after Rochester for All requested his schedule. Alexander was a featured speaker at the CIT International Conference in Florida in August. He marked down on his time card three full work days for his time at the conference. But the emails show he was paid a $1,000 honorarium to speak. Alexander changed his time card to vacation time, even though he hadn’t accrued the days per city benefits policy covering senior managers. The records now make it clear that Alexander attempted to collect from both taxpayers and the conference organizers on a trip that was clearly personal business. Jackson also filled out Alexander’s financial disclosure form for the CIT conference. In one email exchange, Jackson asks the American Psychological Association if it would pay for Alexander’s expenses to the conference. The APA agreed to cover the hotel room, only. That didn’t deter Alexander from using taxpayer dollars to cover the rest of the trip, including his flight. This latest information adds to the major ethical issues surrounding Alexander’s employment as deputy mayor. Sadly, we know the city will not investigate this matter. The mayor, City Council, Office of Public Integrity and Board of Ethics have not acted on information we’ve already reported. 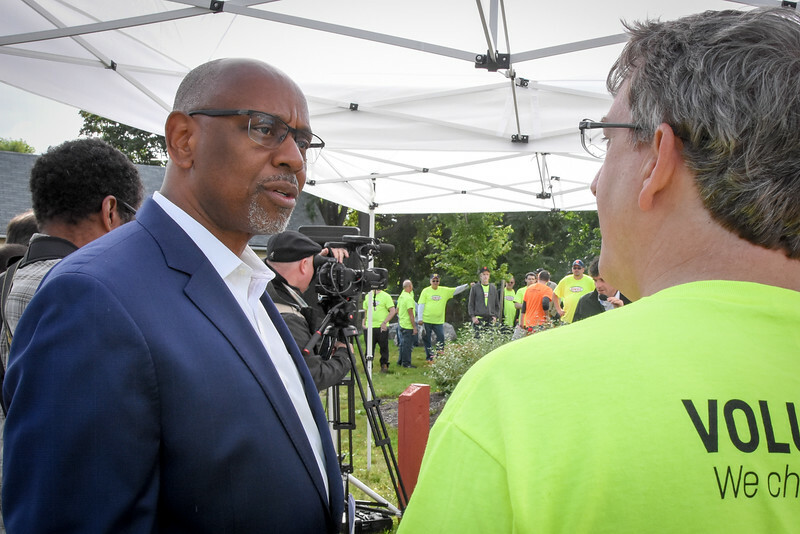 City residents need an outside agency to investigate Alexander’s flagrant abuse of taxpayer dollars, which include theft of vacation days, altering records and using his secretary for personal business.